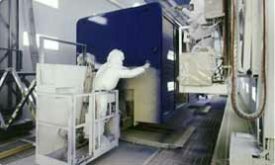 Mickey’s automated, environment-controlled paint facility houses state-of-the-art processing techniques and computer-driven painting system. The freestanding building is totally immune to weather conditions, dust, dirt and other contaminants which can compromise the quality of the painting application. This process ensures the best looking, most durable paint job in the body and trailer manufacturing industry.